We’d love your help. Let us know what’s wrong with this preview of Terra by A.S. Winchester. A young woman possessing a rare kind of intelligence, Cala anxiously counts down the arrival of her eighteenth birthday. It is the day she will be forced to leave her family, her home, and her best friend, Liam, forever. It is the day she will be placed into the Exceptionals Program. However, with seventy-three days to go, Cala's c Cala is not special. However, with seventy-three days to go, Cala's clock stops. Burned alive and reconstructed as a cyborg, Cala enters the Program and quickly learns the truly ugly secrets the Program entails. Will Cala survive the Program? I love dystopias, but I feel like I always read the same thing. By reading the summary of this book, I was attracted by the Sci-Fi side and I thought that it could be different. I wasn’t disappointed. This book is FANTASTIC. I was hooked from the start and I had trouble putting it down to go to sleep after a hundred pages and, the next day, I did not let go of it until I had finished it. The plot is really interesting and full of twists. Some characters we love and those we hate. And, oh yes, emotions, a lot of emotions! If I tell you that this is much better than Divergent, Hunger Games or any other dystopias that I’ve read, better than Illuminae, Does that make you want to read it? The sequel is planned for April 2016. I’m really looking forward to it and I hope that by then Terra: Genesis will be much more famous. J’aime beaucoup les dystopies, mais à force j’ai l’impression de toujours lire la même chose. En lisant le résumé de ce livre, j’ai été attirée par le côté SF et je me suis dit qu’il pouvait être différent. Je n’ai pas été déçue. Ce livre est FANTASTIQUE. J’ai été scotchée dès le début et j’ai eu du mal à le lâcher pour aller dormir après une centaine de pages et, le lendemain, je ne l’ai pas lâché avant de l’avoir fini. L’intrigue est vraiment intéressante et pleine de rebondissements. Des personnages qu’on aime et d’autres qu’on déteste. Et, oh oui, des émotions, beaucoup d’émotions ! Si je vous dis que c’est bien mieux que Divergente, Hunger Games ou toutes les autres dystopies que j’ai pu lire, mieux qu’Illuminae, est-ce que ça vous donne envie de le lire ? Y'all, this is such a fantastic book! Yes, I know it's long, but it's worth every page. I laughed out loud, I cried, I yelled, and I shouted and cheered for these characters! I can't wait until the next book comes out! Cala isn't just exceptional she is extraordinary. And because of this she will be taken from her family at the tender age of 18 to enter "the program." Not knowing how to handle this her family becomes distant and she feels alone. Cala has 173 days left of freedom. But something happens to speed up the process. This very smart girl goes through more than any one human should ever have to go through. But that's just it, Cala isn't exactly all human. However what makes her so vuln Will to survive!! Absolutely one of the hits of the summer, especially in the YA category! This original plot is filled with twists and turns. Everyone must read this book, because it's just absolutely amazing! I read it and finished it in two days and my mum yelled at me to put it down. You'll fall in love with the characters, especially Cala and you'll be wanting to read the next book. Great characters, exciting plot. Looking forward to book 2! Initial thoughts: odd how only days before reading this book I was discussing with a friend potential futures including cybernetics and cyborgs and the possibility of humanity having to leave earth for a new planet due to the depletion of resources on earth. You will love this story if: you like a good action adventure story, although sci-fi you don't need to be a big sci fi fan to enjoy this story, the sci fi elements blend well with the story and incorporate the full tale keeping it believable. My favourite thing about this book: I loved how unpredictable the story was, after the first few chapters I thought I had the whole story sussed, Cala the exceptional will go into the program rebel from within with the help of friends to bring down the new corrupt government ... Oh how wrong was i and this theory was quickly thrown out within a short space of time. Every time I thought I had a grasp on what o thought would happen my theory was time and time again proven wrong and the storyline took me on a whole new spin or twist right up to the last few pages. What I liked about this book: I liked the fact the book was told in a 3rd person narrative from varying people's point of view throughout and I liked that the language used helped to really get into that persons mindset. The really electric vibrant characters that all stood on their own merit meaning even though there was one main character it rarely felt like that and felt more like watching a film seeing all sides and perspectives. I loved the story in itself it is original creative well thought out and really evoked a lot of emotions. Cala is a 17 year old female who will start in the Exceptional Program of New Earth on her 18th birthday and be forever separated from her family and friends. Seventy-three days before her birthday Cala is severely injured in a horrific accident. The only way for her to survive is for her to become a cyborg and immediately be placed into the Program. Can she hold on to her humanity as she finds out what the Program is really about? 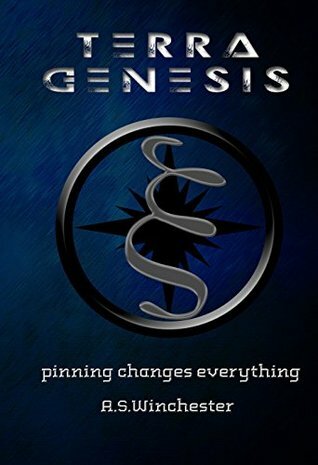 Winchester’s first book in the Terra series, Genesis paints a sta Cala is a 17 year old female who will start in the Exceptional Program of New Earth on her 18th birthday and be forever separated from her family and friends. Seventy-three days before her birthday Cala is severely injured in a horrific accident. The only way for her to survive is for her to become a cyborg and immediately be placed into the Program. Can she hold on to her humanity as she finds out what the Program is really about? Winchester’s first book in the Terra series, Genesis paints a stark picture of a rigid dystopian society in an Earth colony orbiting Mars. Rule infractions are met swiftly with extreme consequence. Everything one does and becomes is based on genetics and rigorous testing. Cala is not one to accept her fate and follow all of the rules which only serves to exacerbate her situation. This book is fairly well written and has only a few errors which is not uncommon in a self-published work. The story is well paced and has several twists that keep it interesting. Therefore, it is a book well worth recommending. I will definitely read the next book in this series. The book was good but the repeated descriptions of characters by their hair color was annoying. This is a fun futuristic, sci-fi, dystopian read with cyborgs who have crazy super human strength. I thoroughly enjoyed the adventure.